First, what is an anomeric effect? The diagram below shows the classic anomeric effect in which a donor (an oxygen lone pair) interacts with an acceptor (a C-O bond). 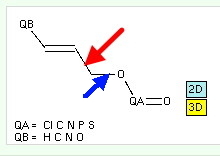 The orientation around the single bond shown with a green arrow is crucial; the effect only happens when the donating lone pair is aligned antiperiplanar to the accepting C-O bond, at which point the lengthening of the C-O bond should be maximal (shown as a dashed line below). The blue analogue is the corresponding effect using an alkene as the donor, but retaining the C-O bond as the acceptor. I had previously addressed this theme by discussing the molecule below. Switching the acceptor from a C-O to a C-cyano bond has the effect of inducing an axial orientation for both cyano groups, a “cyanomeric” effect! Whilst the stronger is undoubtedly the one shown in red, note the blue interaction, that involves an alkene rather than oxygen as donor. One way of providing evidence is a crystallographic search. Here I am using Conquest, the program provided by the Cambridge crystallographic data centre, with the following specification (thanks to Andrew White for helping me frame this search!). I have restricted the acceptor to C-O bonds (this of course excludes C-CN). The C-O acceptor can be enhanced by bearing an electron withdrawing group, which can be e.g. carbonyl, phosphate, sulfate, perchlorate etc. NOT Booleans are applied to restrict the substituents the alkene can carry to only sp3 carbons (or H) by excluding sp2 or sp hybridised carbons. This is to prevent the substituents from delocalizing the alkene (in effect preventing competition from these substituents), but allowing them to stabilise any induced carbocation resonance by hyperconjugation. The C of the C-O is specified as acyclic (to allow the torsion to in theory have any allowed value). The search is also restricted to structures with no disorder or other errors, and an R factor of < 0.075. A total of 215 structures are found, and a scatterplot of the C-O bond length version the (abs)C=C-C-O torsion is shown below. Scatterplot. Click to view a larger version. There are two main clusters of hits, those with torsions close to zero, and those with torsions between ~90-120°. 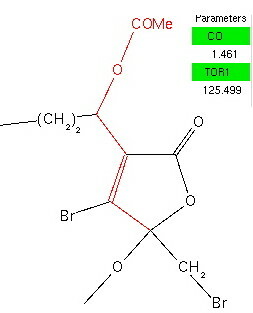 The latter cluster is very clearly shifted to the right of the former, indicating that on average these C-O bond lengths are longer. The red-orange-light green hits (1.46-1.50Å range) are to be found exclusively in the “antiperiplanar” cluster. One might conclude that statistically, the π-anomeric effect appears real. Of course, there may be many other reasons why the C-O bond is lengthened, and each of the molecules above should be individually inspected to exclude these. This sort of structural search takes only minutes (if you know how to formulate it) and I would certainly encourage you to try it out on your own favourite effect! See if the excellent and open CrystalEye resource gives a similar answer (the Conquest /CCDC system is commercial, and not open). This entry was posted on Wednesday, November 2nd, 2011 at 10:10 am and is filed under Chemical IT, General. You can follow any responses to this entry through the RSS 2.0 feed. You can leave a response, or trackback from your own site.